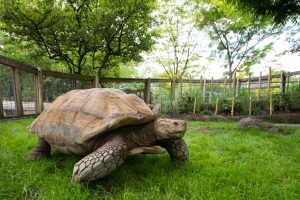 Two huge African spurred tortoises named Dozer and Shelly are settling into their new digs at the Oregon Zoo — and despite the tortoise’s slowpoke reputation, keepers say these behemoths really get around. African spurred tortoises — also known as sulcata tortoises — are the largest mainland tortoise species in the world and have been known to top 200 pounds. Only the island tortoises of Galápagos and Aldabra are bigger. Dozer, a male, and Shelly, a female, tip the scales at around 170 and 90 pounds, respectively. The two tortoises are believed to be around 25 to 30 years old, and came to Portland from New York’s Seneca Park Zoo. Visitors can see them most days in the Oregon Zoo’s Africa Savanna section. Pettit says the name is actually short for Bulldozer, a tribute to this species’ exceptional strength and excavating abilities. Although African spurred tortoises are bred and sold throughout the United States, Pettit warns not to acquire them as pets. African spurred tortoises are listed as a “vulnerable” species by the International Union for the Conservation of Nature. In addition to collection for the pet trade, the tortoises are threatened by habitat loss and poaching.